Sometimes things work out way better than you could have imagined. 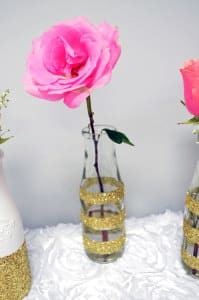 Like these absolutely stunning DIY Gold Glittered vases. Just last month while shopping at one of my favorite stores (Trader Joe’s) they were selling these Candy Coated Milk Chocolate Pieces as a seasonal item. Immediately after buying the candies I knew exactly what I was going to use the bottle for. When I took the bottle home, I quickly emptied the delicious candy contents out and proceeded to make my half gold glittered and half white vase. The results were stunning, I returned the next day to buy more candy bottles. 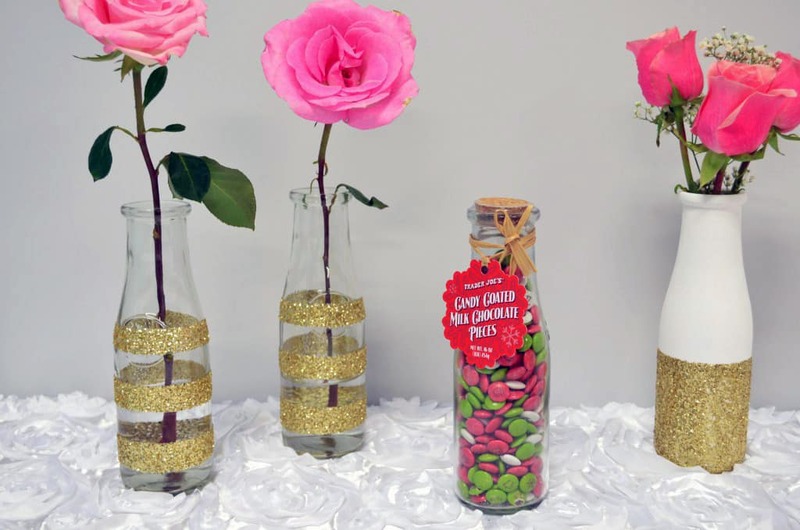 I loved the candy, but I loved these bottles even more to use as center pieces for my daughters Gold Pink and White Princess Birthday Party. B E A utiful right?! My favorite ended up being the gold striped vase to my surprise, but together they all were ravishing. This was a very simplistic task and the end results are impressive, I’m highly encouraging you to find taller glass bottles and get going on creating your new favorite vase. You don’t need to have a special event to enjoy the beauty of this vase, simply fill with water add gorgeous flowers of choice and place in your home. We all deserve pretty things to look at and enjoy! Also, you do not have to wait for someone to buy you flowers, buy them for yourself and smile.